Between “Rush Hour” and the James Bond films, Jackie Chan and Pierce Brosnan became two of the biggest action stars of the ’90s. Now they are going head-to-head in STX’s revenge thriller “The Foreigner,” which got its first trailer on Monday. Based on Stephen Leather’s novel “The Chinaman,” Chan stars as Quan, a humble businessman and single father who emigrated to London from Vietnam. One day, his peaceful life is shattered when his daughter is killed in a terrorist bombing. With nothing left in his life, he finds a British government official named Hennessey (Brosnan) and demands he reveal the names of the bombers. When Hennessey refuses to do so, Quan goes hunting for them anyway in a brutal revenge campaign. In the process, both Hennessey and Quan’s dark pasts are revealed, as Hennessey is confronted over his roots in the IRA even as he uncovers Quan’s past as a soldier in the Vietnam War. The film will see Brosnan reunite with director Martin Campbell, who directed Brosnan’s debut Bond film “GoldenEye” as well as Daniel Craig’s first 007 installment, “Casino Royale.” The film is written by David Marconi, with Chan, Wayne Marc Godfrey, Arthur Sarkissian, Qi Jian Hong, Claire Kupchak, Scott Lumpkin, Jamie Marshall, and Cathy Schulman as producers. “The Foreigner” arrives in theaters October 13. Watch the trailer above. 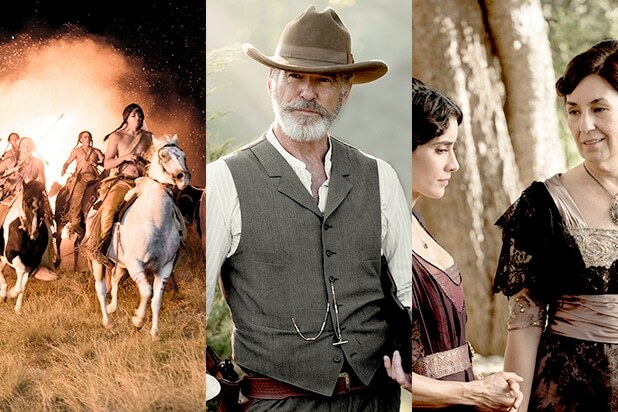 Here's 10 exclusive photos from AMC's newest drama series," The Son," starring Pierce Brosnan. AMC's newest drama is based on Philipp Meyer's "The Son," about generations of a Texas oil family. AMC's "The Son" spans three generations, from when Texas became an independent Republic to present day. Pierce Brosnan stars as Eli McCullough, the patriarch of the McCullough family, on AMC's "The Son." Young Eli (Jacob Lofland) grows up amongst the Comache Native Americans after he's kidnapped as a child in Texas. On AMC's "The Son," the younger version of Pierce Brosnan's character Eli is abducted by the Comache tribe and is raised among them. AMC's "The Son" spans three generations in Texas, and follows the McCullough family. Paola Nunez plays Maria Garcia, a member of the last Spanish aristocratic family in Texas, on AMC's "The Son." Henry Garrett as Pete McCullough and Pierce Brosnan as Eli McCullough, on AMC's "The Son"